The Rocket II is a modified Van's two place RV-4. 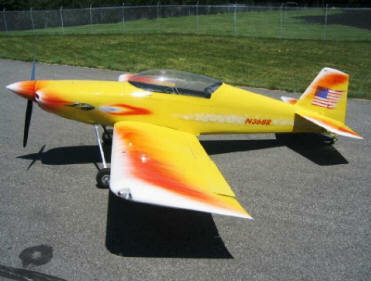 The kit to build a Rocket II from John Harmon is an extension of RV-4 kit which is purchased from Van's. With the intended use of bigger engines the altered fuselage is wider and the length 18 inches longer. The modified wing was tested by an independent engineering facility. A unique modification is titanium for the gear legs which provide a difference in feel when landing and also doesn't shimmy during ground operations. The HR2 is not a quickbuild kit as many builders of the Rocket prefer to be more involved in the aircraft building process and express a preference of some minor fitting and trimming. An economy cruise speed of 215 mph at 55 is average for a Rocket II with a LYC.10-540 -C4B5/250 hp. 2575 rpm. while there is one Rocket that has a 340+ horsepower and can cruise at 275 mph. Engine: LYC. 10-540-C4B5/250 hp. 2575 rpm. Propeller: Hartzel 80 in. dia. Span: 21 ft. 10 in. Wing Area: 109 sq. ft.
Wheel Track: 6 ft. 6 in. Wing Loading: 16.4 lbs/sq. ft.
Cruise Speed 75%: 230 mph. Econ. Cruise 55%: 215 mph. Rate of Climb (gross): 3100 fpm. Wing Area: 99 sq. ft.
Rate of Climb (gross): 3600 fpm.